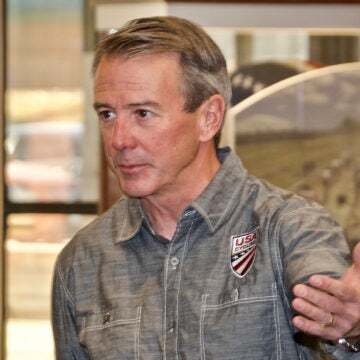 On Wednesday, USA Cycling sent an email to riders who had registered for 2015 cyclocross national championships to address concerns and complaints stemming from the postponed Sunday races. The following is the complete, unedited letter, which was signed by USA Cycling’s vice president of national events, Micah Rice. In light of the events of this past weekend at the 2015 USA Cycling Cyclo-cross National Championships, I wanted to take time to address a few of the circumstances, decisions and reasons for those decisions that went into the timeline of events from Sunday morning until the competition’s conclusion on Monday. I hope that the information below will answer some of your questions and provide you with a better understanding of what exactly happened in Austin this past weekend, particularly regarding the Sunday postponement and the decision to have the women’s 15-16 juniors ride with the 17-18 divisions. First and foremost, we would like to apologize. The situation of postponing an event, especially on the final day with no time following the postponement where we could reallocate various divisions, is frustrating for all involved. We know how hard all of you trained and that you spent hundreds if not thousands of dollars to travel to Austin; and that you took time off of work and/or school to be at our event. Regardless of whether or not you were able to stay or you had to get back to work or school—or if arrangements were too expensive to justify—we are truly sorry that this happened. While unexpected circumstances, which will be further outlined below, did arise, this event has the USA Cycling National Championship seal on it and is thus our responsibility. Anything that happens at our events, good or bad, ultimately falls on our shoulders. For those riders who picked up a number but were unable to race on Monday due to the change in schedule, you will see a full refund shortly. As a National Governing Body, we do all that we can to account for any situation. We spent hundreds of hours on the phone, exchanging emails and doing course visits and walkthroughs with the Austin city officials and the Parks and Recreation Department in the three years leading up to the event. In that time, we assembled contingency plans for weather, parking and any and all other imaginable circumstances that could strike Austin before or during our five-day event. We even had a backup venue selected from the time the original bid was submitted in the event that we could not run the championships at Zilker Park. We shared with the local government the extent to which the park would be damaged and made it clear that USA Cycling has monies budgeted to go into repair any damage to the grounds, a process that will begin this week. Our first interaction with the Heritage Tree Foundation was during the course build out where we informally walked the course. These course surveys were based more on how to protect the roots with mulch. Yes, there was talk about critical root zones, but the course was very dry and specific adjustments were not formally required. However, as we discovered after the amount of precipitation and subsequent course being compromised with mud, divots, etc., the Austin Heritage Tree Foundation felt that the course ran too close to the root systems of these trees, threatening the trees’ health. Unfortunately, during the 36-month preparation for these championships and numerous discussions with the city, there was never mention of this concern. We performed a course walkthrough several months out as well as during course construction, and we did numerous walkthroughs during the event. These walkthroughs included Parks staff and their own forestry and tree expert. We were always told to work with our liaison with Parks and Recreation and we made all changes to the course based on their recommendations. Had we been asked to make additional changes at any point, we would have happily routed the course farther away from these root beds and done our part to stay away from these prized trees. In fact, the first signs of concern we heard outside of making sure there was enough mulch over the root beds came last week when events were already underway. At that point, there was no indication that the Austin Parks and Recreation Department would consider pulling Sunday’s events. They let us know there was some apprehension among some citizens, and we reminded them of plans to repair park grounds following the Championships, but the city never informed us that we were at risk of shutting down for Sunday. Their only shared concern was parking—if we had too much rain we may be forced to move to our Plan B for parking (for which we were already prepared with maps and communication created weeks before). When we arrived at the course on Sunday morning for the final day of competition, we started receiving reports that police were turning riders away around 7:15 a.m. The confusion was abundant across the board since we had not received any communication from the Parks Department that they wanted to shut the event down, which was in response to concerns raised by the Austin Heritage Tree Foundation. I can assure you that from the moment we first received reports of police turning competitors and fans away, we began calling and emailing Parks officials. When we did finally reach someone, the department was adamant about closing the park for 48 hours to allow crews to lay mulch over exposed root areas and re-asses the course. Obviously such a position was an impossibility in our eyes because we were adamant that racing had to happen. As discussions and negotiation continued with the city over the next two hours, police began threatening to arrest USA Cycling members who were in the park waiting on further word from us, citing that the park was closed and cyclists were loitering. We felt at that point that it was in everyone’s best interest to make the announcement that the event was cancelled and for all to disperse at the instruction of law enforcement. After this announcement was made, we still continued to press city officials to see what, if anything, could be done to get our last day of racing in. During this time, I also met twice with the pro teams to discuss our options and hear their preferences moving forward. With Sunday now an absolute impossibility, we discussed riding on Monday with the teams, which they unanimously favored over other options that included finishing Nationals after World Championships or having the last day at a separate location in the coming week or so. We came to an agreement with the Parks and Recreation Department around 10:30 a.m. to let the park settle for 24 hours, lay down mulch and soil on exposed root areas and rework zones of the course under scrutiny—all compromises that we would have been happy to make at an earlier time. Sunday afternoon, we did a 90-minute walk-through with the Parks Department and two arborists from the Austin Heritage Tree Foundation, and all sides were pleased with the changes. Please keep in mind that during all of this, we had to be deliberate in what was said and not said publicly. We absolutely did not mean to show a lack of transparency or to keep any of you in the dark; our No. 1 goal was to ensure that the competition happened, and we couldn’t afford to burn bridges along the way and risk losing the park on Monday. Since then, we have been in thorough discussion with all organizing parties involved to make sure that everything we share is accurate and not speculation because, as dues paying members, you deserve nothing less than the truth and the facts. With the negotiated start time of 12:30 on Monday, we were obviously short-handed on time, which forced us to make some difficult decisions. The 12:30 p.m. start only allowed us five slots in which we could hold races. The final three of the day went to U23 men, elite women and elite men, which left two slots for men’s and women’s 15-16 and 17-18 juniors divisions. The decision was ultimately made with the Chief Commissaire to race the men’s 15-16 division solo at 12:30, with the women’s 15-16 riders on course with the 17-18 men and women. Unlike a local cycling event, our goal at a National Championship is to protect the integrity of the podium, especially World Championship classes where UCI points are on the line. We want to make sure that the front of the race has no obstacles to overcome so that we have a deserving winner and the podium riders have as little traffic to run through as possible. The riders in contention for the medals would have fewer slower riders on course that they had to pass—had the women’s 15-16 riders been forced to start behind the men’s 15-16, the front of the women’s race would have been riding through much more traffic on lap one. Also, given the mandated course modifications, the shorter juniors course was no longer available for Monday’s racing. However, even if the 15-16 women had been afforded their own individual time on the course, the outcome of the race and number of laps for the winner would have been the same. Because they were turning 13-14 minute lap times for the 30-minute race, this category would always have done a total of two laps (winning time 26:12) rather than three laps (approximately 39:18). For those riders turning a slower first lap, in accordance with the way the events were run throughout the week, anyone turning a first lap time that would result in a projected total race time of over 36 minutes was pulled from the race after the first lap. On Monday, this accounted for riders placed 15th and farther back. Possibly seven additional 15-16 women would have been able to do one more additional lap in perfect circumstances. Was this an ideal situation? No, especially considering that our goal from the beginning was to showcase this women’s group on the final day of Cyclo-cross Nationals along with the elite riders. This was an unfortunate and unavoidable byproduct of a delayed and condensed schedule. While I know that it does not begin to resolve the situation, I hope this information at least helps explain where we as an organization came from in our decision-making. Like you, we are also very frustrated in this chain of events that led to the postponement of Sunday’s races in Austin. Our membership and riders are our No. 1 asset and priority, and we feel terrible that all involved experienced this postponement. If you have any further questions or concerns, do not hesitate to reach out to me personally at mrice@usacycling.org or at 719-434-4283.